This picture was taken in a national park in the northern parts of Sweden. The lynx just stopped and started growling i took this picture and just baked down !! My hart was pumping like hell at this stage.. 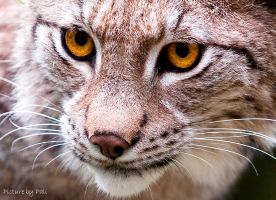 I love love love that this is an actual wild lynx! The eyes stand out great, it's a very intense shot, and I love your little story. I absoulty believe you, cats can be pretty dangerous, and when they are bigger than it's much worse. But it must have been a great Moment, and a great Pic too. hehe i see what is your favourite animal now then? At this point it wasn't even dangerous and the people just beat him. But the most are really shy and they won't really attack a Human. Actually I like all animals, but the cheetah, tiger and Wolf are my very favorits and yours? Yeah, I have to show you the link to this article. How awful human can be. The stance so says "I stopped dead in my tracks". You were very fortunate to have seen this beauty. Ooooh, beautiful and aggressive... I love it! #WildlifeHQ has featured you in the first version of our News Article to help bring recognition to your fantastic animal work and also to bring more attention to the group as well. Please consider the News Article to help spread the news article feature to a wider audience on deviantART to see and to enjoy. You are very welcome Pali. i wouldnt get to close to that picture. I might get bitten. Under which license does this fall? I'd like to use it for a non-profit personal website. I would need to edit it a bit, and I would of course backlink it to your profile and add a (c) sign. Wow! You are so lucky to get the lynx in such a great pose! I also love how the snow is sparkeling and the snow on it's nose! You did such an amazing job on this photo. You are very welcome. I just like your photos a lot.